11.Chief of the Twelve Tribes. 13.Knight of the Ninth Arch.14.Ancient Grand Elect. 17.Knight of the East and West. 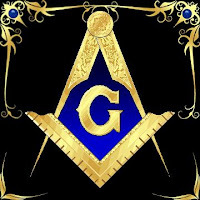 21.Grand Master of the Key of Masonry. 22.Prince of Libanus or Knight of the Royal Axe. 24.Commander of the Black and White Eagle. 27.Sovereign Commander of the Temple. 29.Grand Scotch Knight of St. Andrew. 30.Grand Elect Knight of Kadosch. 32.Sublime Prince of the Royal Secret. A Note on the Square, Compass, and "G": The Square represents the Earth, which is symbolic of earthly, superficial knowledge. The Compass is representative of the the Heavens and the orbits of the planetary bodies. The Compass embodies the deep hidden knowledge of Freemasonry. What is very revealing about the Compass is that it is set above the Square. In other words, within the philosophical paradigm of Freemasonry, esoteric knowledge takes precedence over visible, superficial knowledge. In fact, to the enlightened Freemason, superficial knowledge, that which we can see and comprehend with the natural mind is simply an illusion. The "G" is the Grand Architect who is expressed as none other than Lucifer himself. And this is the mind that rules the world. Zionism is a mere expression of this demonic power. And finally, the meshing of the three symbols represent the coexistence and co-dependence of superficial and esoteric knowledge with the Grand Architect being at their center and Kabbalistic root. In some depictions, the "G" wraps itself the Square and Compass, signifying the Grand Architect's full possession of this knowledge. From the very beginning, it has been about knowledge with Satan. It was with knowledge that he deceived Adam and Eve and it is through knowledge that he is destroying this world. May Yah keep us!